Work is underway on the refit of Bruce Farr racing yacht Sapphire Knight at the Seaway yard in Monfalcone, Italy, according to Adam Voorhees, who has shared news of this new contract. US-based Voorhees has designed the project that will add a metre added to her LOA at the transom, turning her into a 26 metre fast sailing yacht. With Kevlar and carbon the main build materials, the boat will have a new deck and deckhouse fitted, along with a new mast and boom. There will also be keel modifications. The interior will be completely redesigned and decorated. 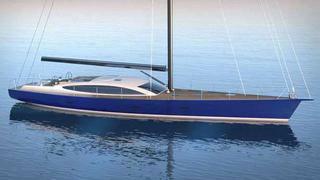 The project is taking a 25 metre racing yacht as the starting platform with naval architecture by Bruce Farr. She boasts an aggressive yet easily handled sail plan and will be at home on the race course as a blue water cruiser or a coastal cruiser. Talking about his new project, Voorhees said the brief from the owner, who is an experienced yachtsman, called for a voluminous interior with full visibility from the large saloon, as well as fully equipped spaces to ensure casual luxury for family, friends and on charter. The interior will be finished in a contemporary and comfortable style, according to Voorhees, complimenting the yacht’s clean lines and sleek profile. Accommodation will include a large owner’s cabin forward, two en-suite guest cabins and separate facilities for the crew including two double en-suite cabins and the galley. Delivery is anticipated later this year. Vorhees has experience in this length and type of yacht, having designed a previous 25 metre maxi cruising yacht with a modern interior and totally glass roof to the cabin. He was responsible for a 70 metre sailing superyacht unveiled at last autumn’s Fort Lauderdale Boat Show and has designed a range of superyachts in the sail and power sectors, including a five deck superyacht with an LOA of 77 metres. Seaway is a multi-faceted design, engineering and construction business that has collaborated with major boat builders and created their own brands, which include the hybrid motor yacht marque Greenline, OceanClass and Shipman carbon sailboats.